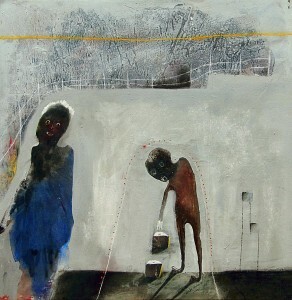 Shabu’s mixed-media paintings explore the frail condition of humanity and the callous ways in which we treat each other. In a ravenous world, wheeled by the rich and powerful, he genuinely and relentlessly empathizes with the kind, the poor, and the displaced. Zihan Kassam on the work of the Kenyan artist Shabu Mwangi. 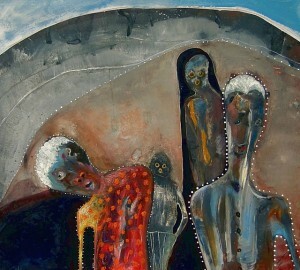 Into the psyche of the Kenyan artist Shabu Mwangi. He doesn’t say a lot but when he does, it’s good. And even though the world needs more people like him, it is usually the quiet, conscientious individuals like Shabu Mwangi that are the solitary souls — wallflowers who are overshadowed by those who shriek, screech and squeal the loudest. 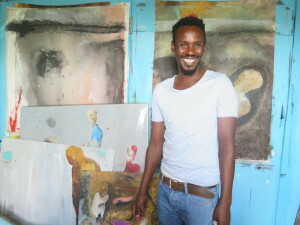 So, when Shabu invites me to his studio in Guantanamo slum, I am honoured. We take a closer look at his emotive, amorphous figures that often feel distraught and numb at once. We discuss the forgotten factions who suffer at the mercy of neglectful governments, greedy autocrats, war or domestic abuse. 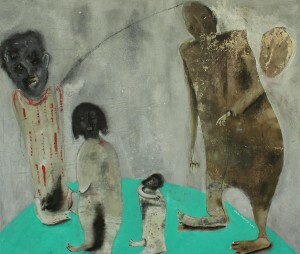 Shabu’s mixed-media paintings explore the frail condition of humanity and the callous ways in which we treat each other. In a ravenous world, wheeled by the rich and powerful, he genuinely and relentlessly empathizes with the kind, the poor, and the displaced. “Many of my paintings are about injustice,” he explains. “We have lost the feeling of being human. 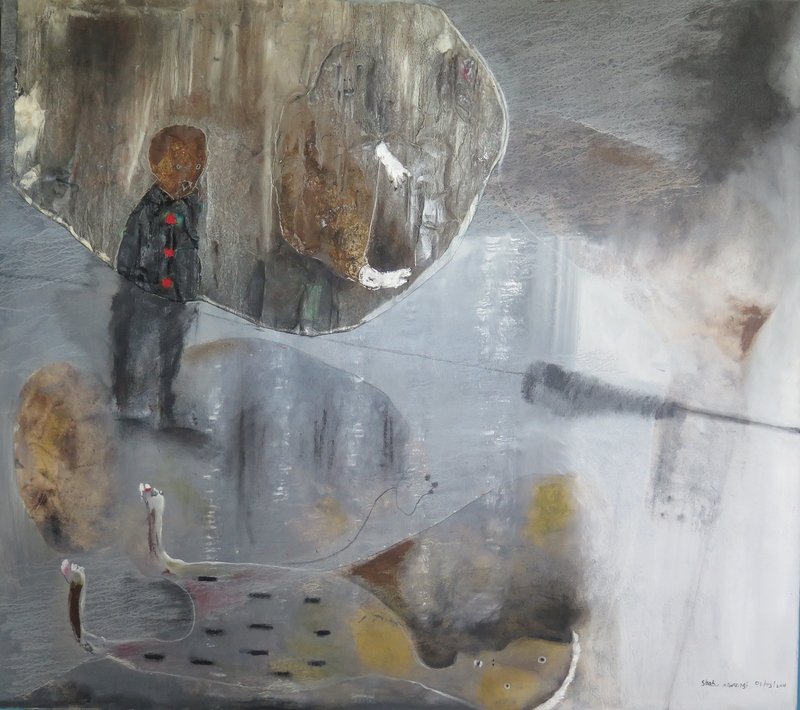 We don’t pay attention to how we are hurting others anymore.” In his painting ‘Border Control’, we catch a figure in uniform, a man in a position of authority. He gapes down at another man lying on his back. In the background, a women watches frightfully. “This is about what is happening at the Somali-Kenya border. It is hell for Somalis. They aren’t fleeing because they want to. They do it because they have to.” Delving in to the issue of forced migration, Shabu sees nationalism as a dangerous psychological phenomenon where arbitrary physical borders disconnect people and breed violent, unnecessary hostilities. If one is lucky in life or ‘blessed’ as some call it, they will cross paths with a philanthropic soul who recognizes their talent or good intentions, someone who will take a risk to assist them and lift them up. Very likely it will be someone who was also facilitated in this way. And so, compassion begets compassion and the cycle endures. For Shabu, that humane force was the Irish Catholic sisters from Mukuru Arts and Craft Centre that gave him the opportunity to cultivate his potential as an artist and work in-house. This is where Shabu began to experiment with different ideas, learning how to manifest his messages through drawing and painting. 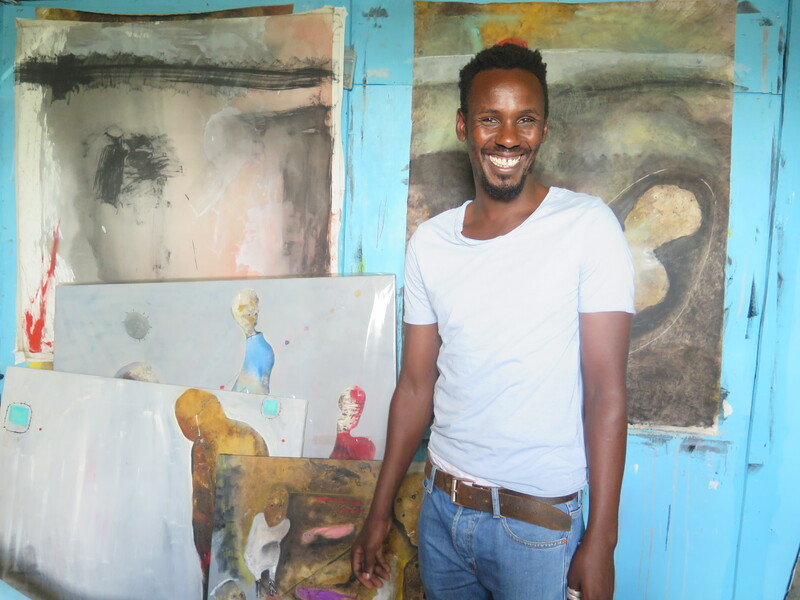 He showed serious talent and only a few years later Shabu was exhibiting at venues like the Belgian Embassy, Le Rustique Restaurant and the One Off Contemporary Art Gallery in Nairobi. 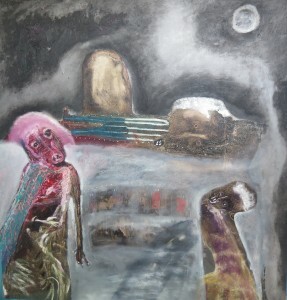 In 2012, Shabu participated in a group exhibition at the Kenyan Embassy in the USA and the Out of the Slum exhibition for Mukuru slum artists in Essen, Germany. In 2014, his work hung at Pop-Up Africa at the Gallery of African Art on Cork Street in London, UK. There was interest developing around Shabu’s profound imagery and provocative subject matter and his work started being collected by local and international audiences. As soon as he began doing well, Shabu put together a team of peers and started a project to do what others had done for him. In 2004, Shabu founded the Wajukuu Art Project, offering vulnerable children from the slums basic counselling and support through creating art. The collective was registered in 2007 with members Joseph Waweru, Ngugi Waweru, Razaraz Tumbiti, Sammy Mutinda, Josephat Kimathi and Freshia Njeri. Wajukuu has grown quickly, with new initiatives such as the quarterly Wajukuu Slum Art Festival (next one in April) and documentary sessions about social and political issues as well as Art and Health. It is Shabu’s hope that slum children will be educated on real-life issues and become better equipped for the future. 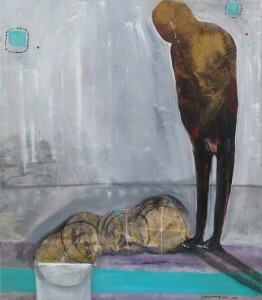 Shabu continues to portray the plight of the neglected and mistreated. For those who need a more literal, more embellished message or perhaps a more realistic depiction of the world they think they know, this type of artwork is not for them. It neither spoon-feeds nor begs your approval. The world likes noise, and lots of it, but only a few have the ears for messages put across in such a quiet, subtle and sensitive way. Shabu’s peculiar characters resonate with perceptive, introspective individuals who can hear the wind through the clamour. It appeals to those who consciously refuse to be the doddering robots that bow to the age of confrontation and competition. 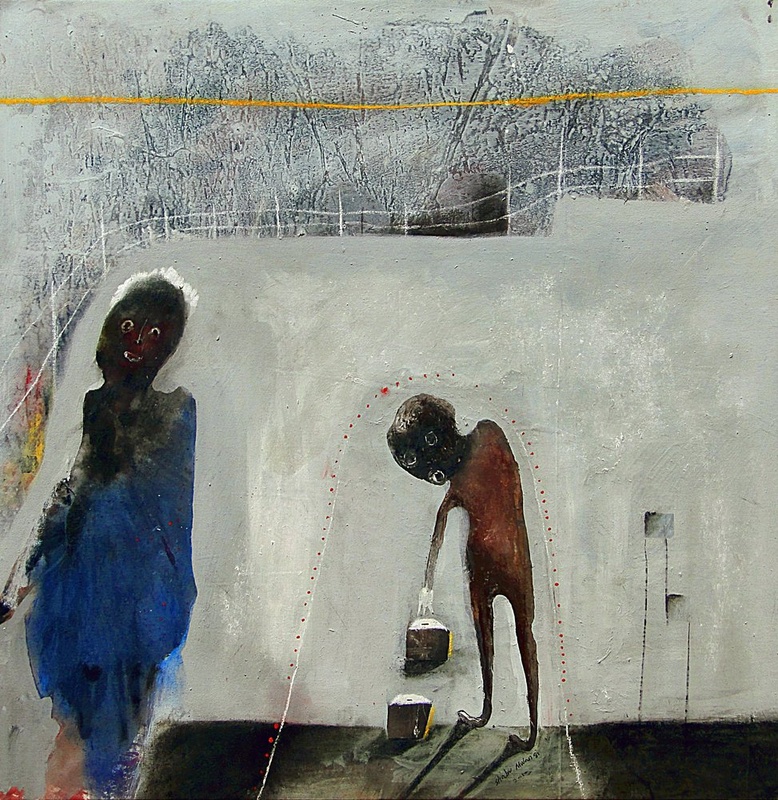 Zihan Kassam is an artist and art-writer based in Nairobi, Kenya. ← Street Art: taking art to the people.